Center of the block II pattern hits the mid mark with precision. Second time to hit the mid mark on the dot! 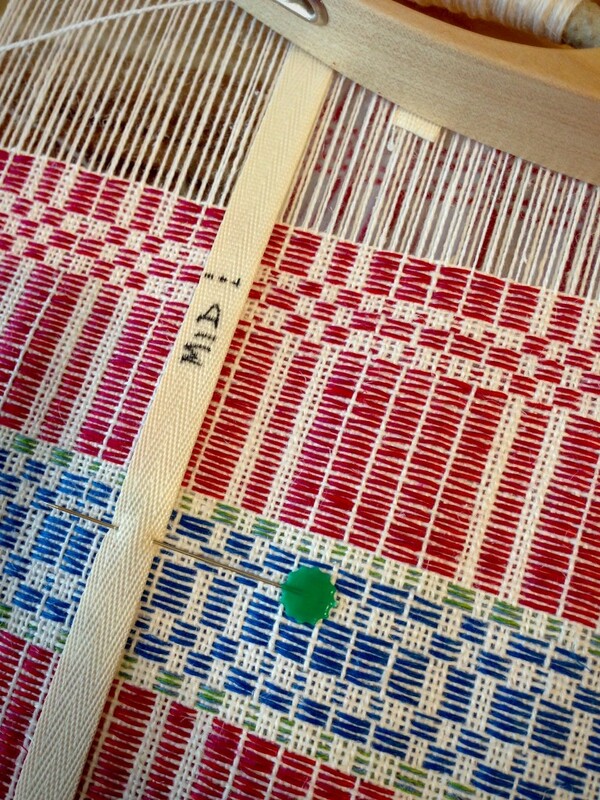 Halfway on the measuring ribbon. 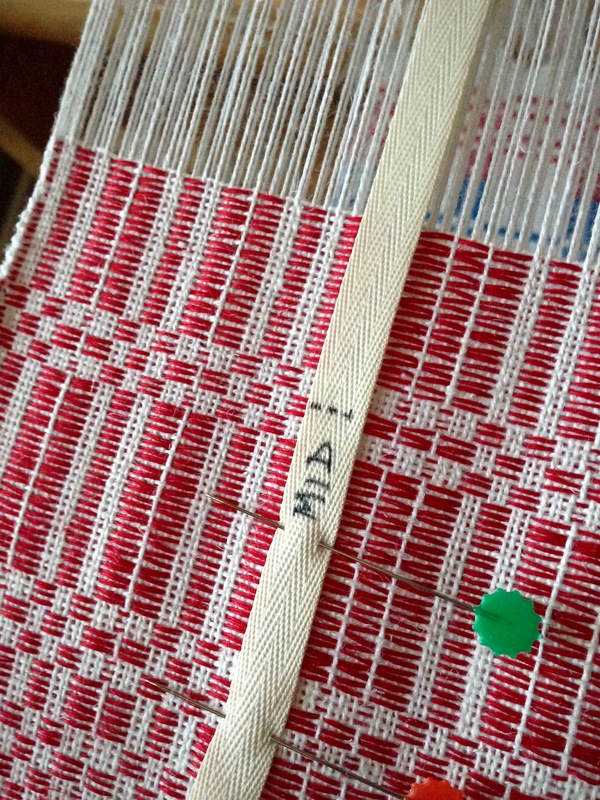 The border and hem are marked at the end of the ribbon. A promise fulfilled is like a treasure unearthed. You hope for it, and might even expect it; but it’s a joyful thing when you experience it. We wait for a promise like we wait to see the “mid” mark on the ribbon. The Lord’s promise is a vast treasure. It’s a treasure worth watching for. May you unearth splendid treasures in the new year. I love your work. I am continually renewed, however, by your gems at the end of your posts. Have a joyful new year. I’m pleased that you consider them gems! Thank you! 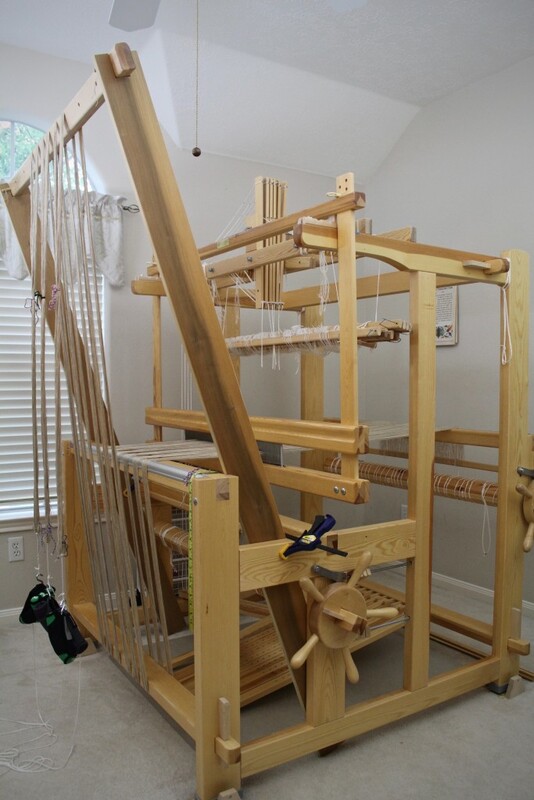 The linen on my loom last spring was a secret project. I only showed hints of what I was doing. 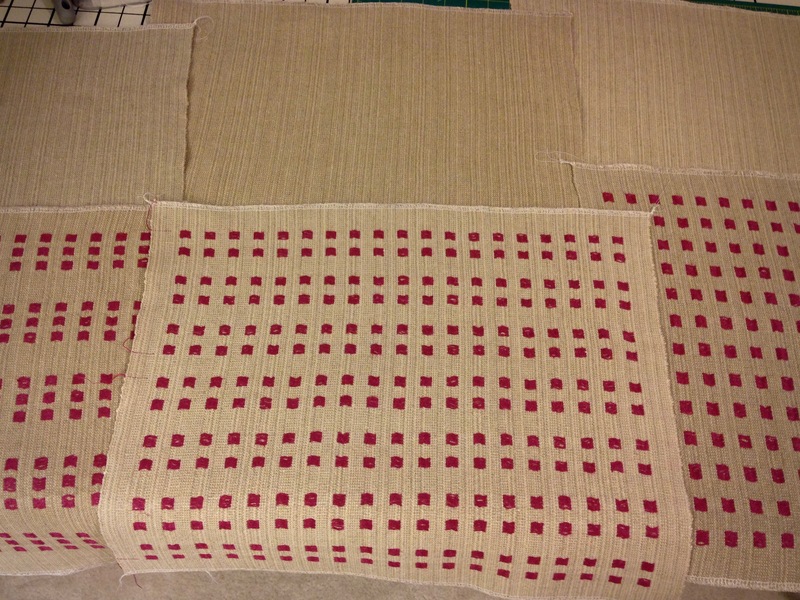 Now that the “secret” linen project is published, let’s go back to see some of the process. 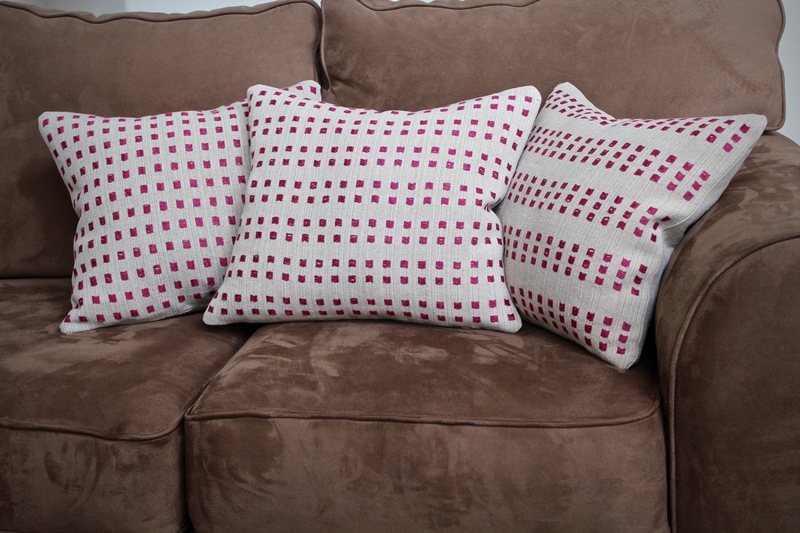 Complete instructions for weaving and sewing these Linen Dice Weave pillows are in the January/February 2015 issue of Handwoven magazine. Read how it all came about in Caught by Surprise – in a Good Way. Ready to pre-sley the reed. 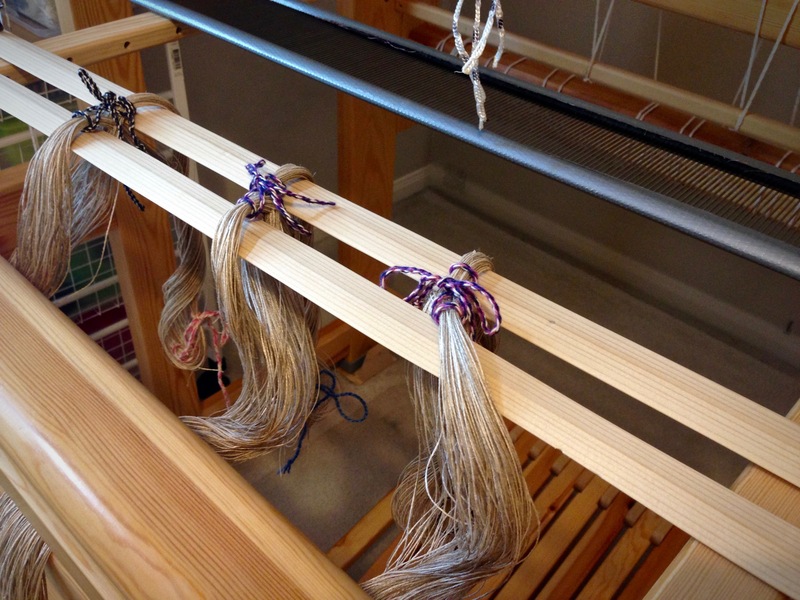 Warping trapeze in action to beam the linen warp. Ready to thread the heddles. 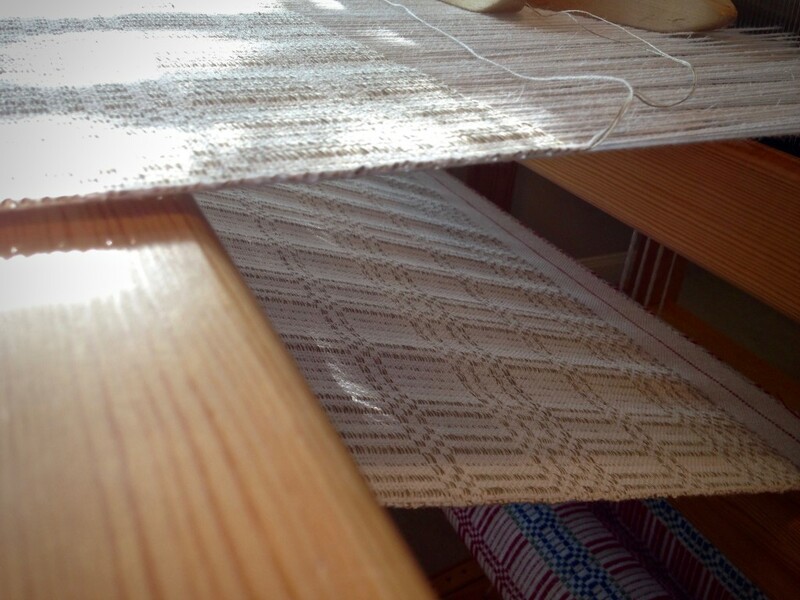 Linen dice weave as seen through the warp. Coming around the cloth beam. Two sets of linen dice weave pillows. Linen dice weave pillows ready to send. May you and those you love make meaningful memories on this Christmas day. That was beautiful seeing your whole process, including seeing the trapeze. I made one for my baby wolf but not for my Glimakra. That is something I plan to do this year. 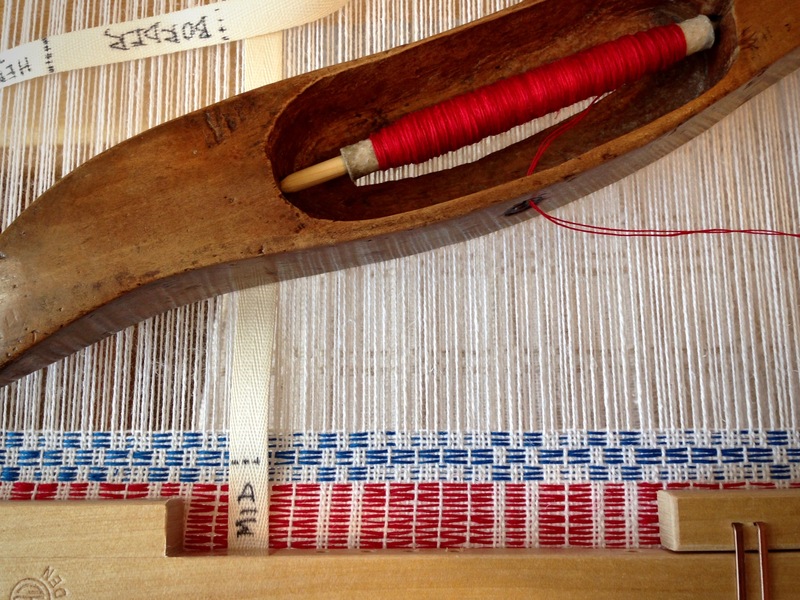 Thank you for a wonderful year of weaving posts. I have enjoyed them all. I love having you along on this journey! Merry Christmas to you, too! Oh I forgot to say. Wishing you a Merry Christmas and a wonderful New year. Merry Christmas to you from Visalia, Ca!! 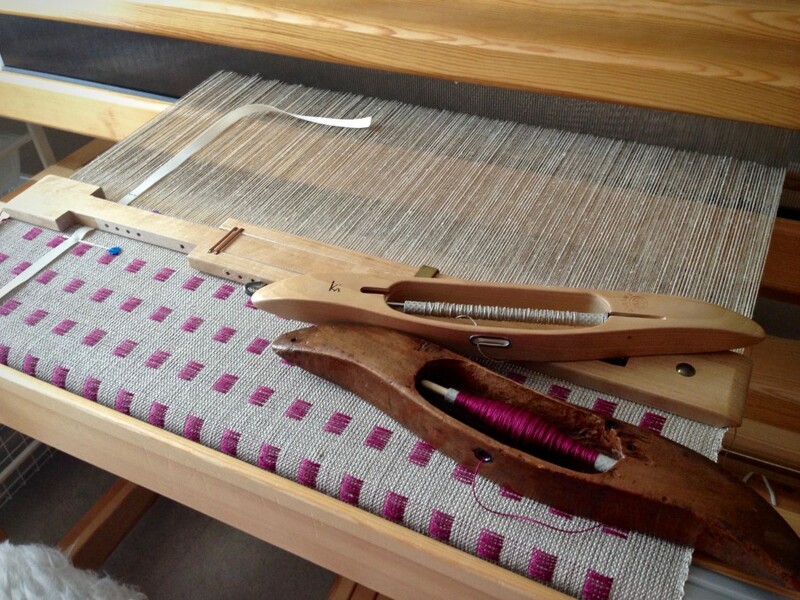 Love your blog and everything you include…very encouraging and motivating to see all of your projects and hints you give to weave. A very Merry Christmas to you, Marlene! I’m so happy that you find encouragement here. Thank you so much for letting me know! Wow! That was wonderful to see in production! Hi Janie, I think it’s wonderful that you enjoyed seeing it! One by one, the towels are collecting around the cloth beam. 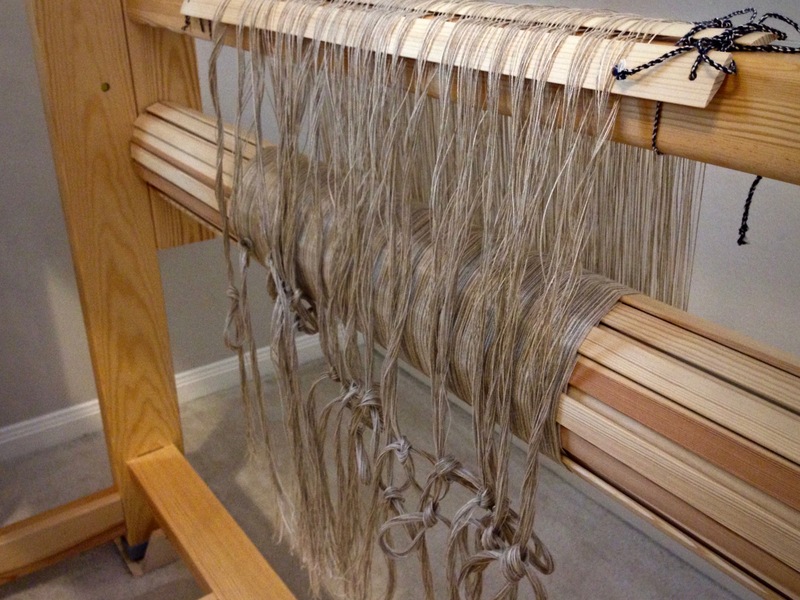 Each new towel on this warp is a welcome adventure. The thick and thin structure grants many interesting possibilities. 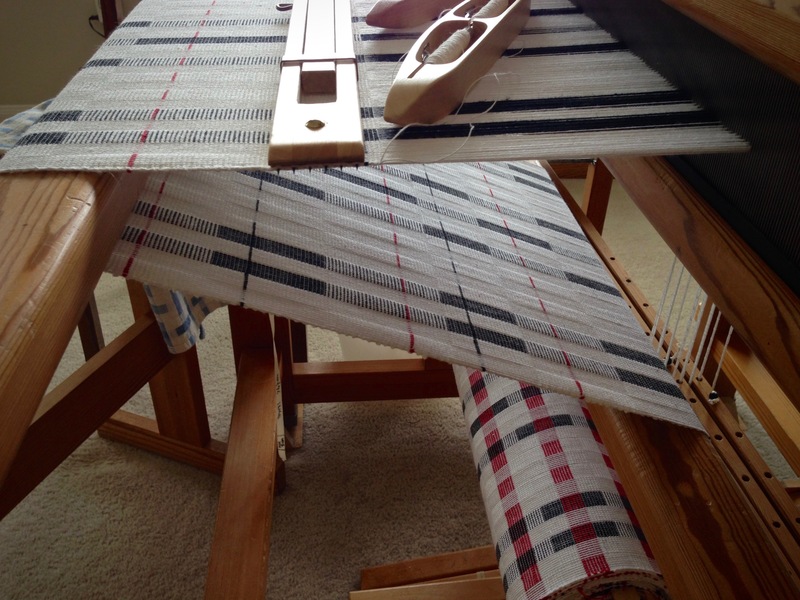 Repetition is hardly noticed because a minor change in the weft order changes everything. It’s the wonder of it all that I find delightful! Cottolin is 60% cotton and 40% linen. The resulting fabric is marvelously absorbent, perfect for hand towels. 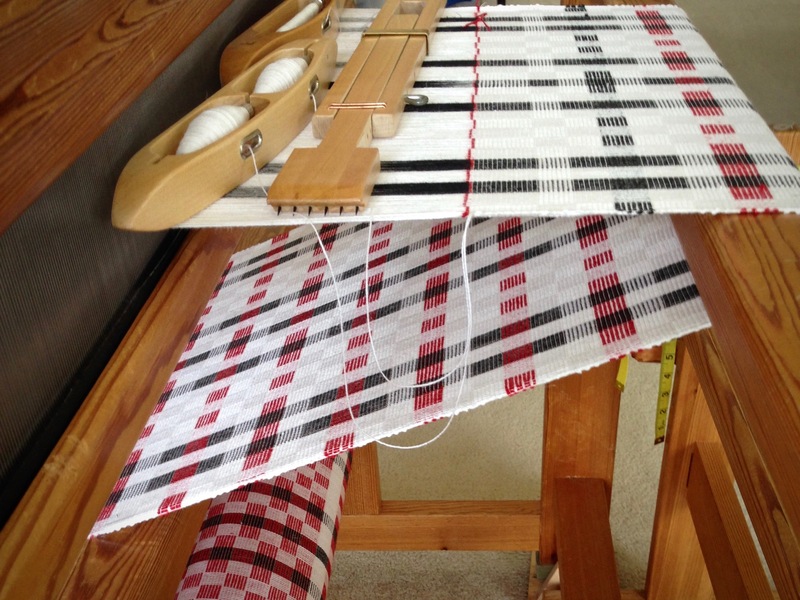 Double bobbin shuttle simplifies doubling the weft. 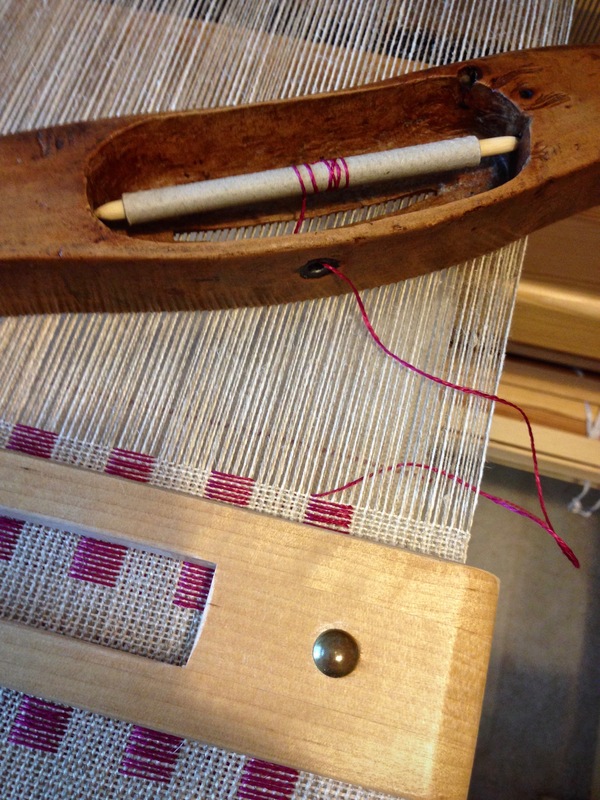 Narrow weft stripes are randomly sprinkled along the towel. Everything about the Christmas message is filled with wonder. Immanuel, God with us. With this news, the daily repetition of life is invaded with delight. Enjoy the wonder of Christmas! May your home shine with the wonder of it all. In the afternoon light the linen takes on a golden appearance. 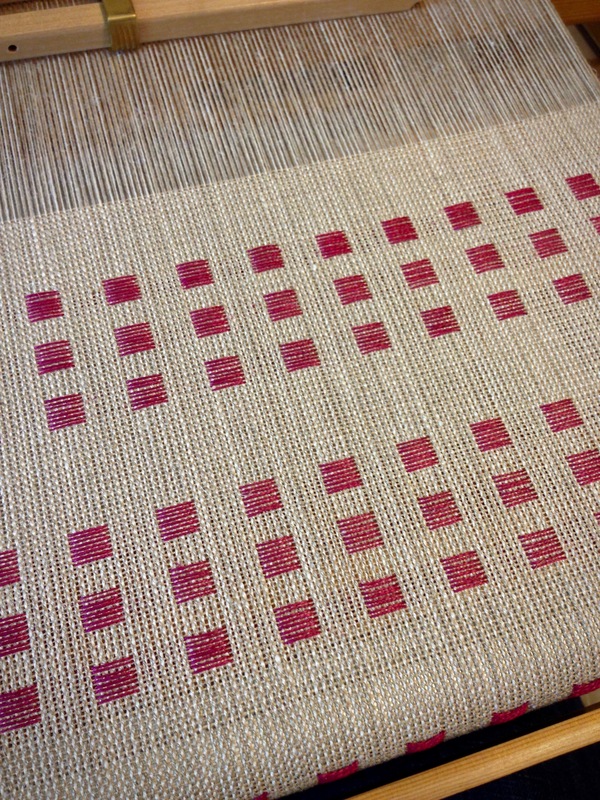 The halvdräll pattern in the cloth is no less distinguishable in these low-contrast weft colors. 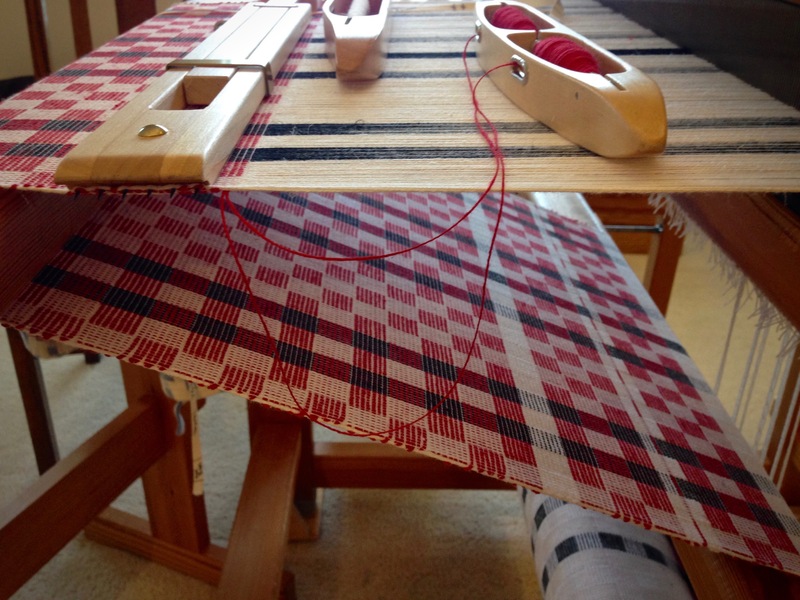 In fact, the pattern seems more embedded in the fabric now than it did with the vibrant red weft in Weaving Christmas. Natural unbleached linen over white bleached cottolin brings monochrome elegance to this table square. 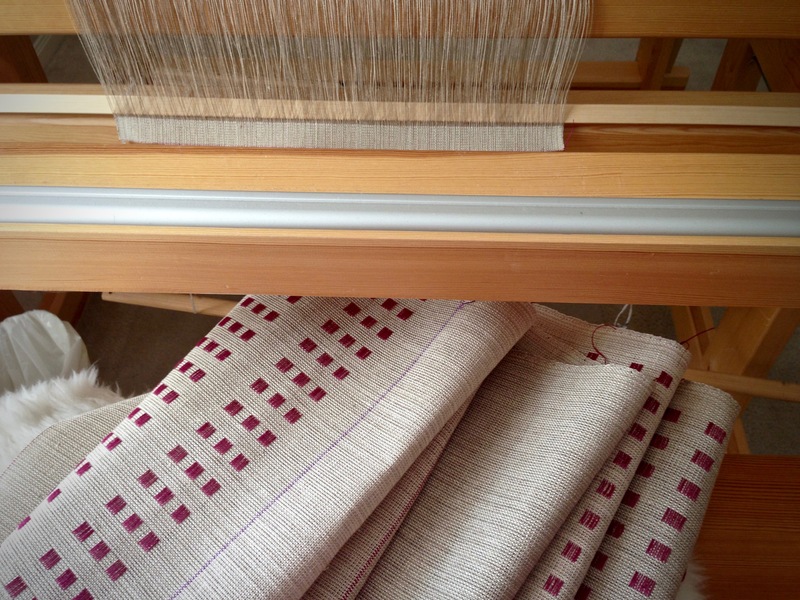 Unbleached and half bleached 16/1 linen are combined for the pattern weft. 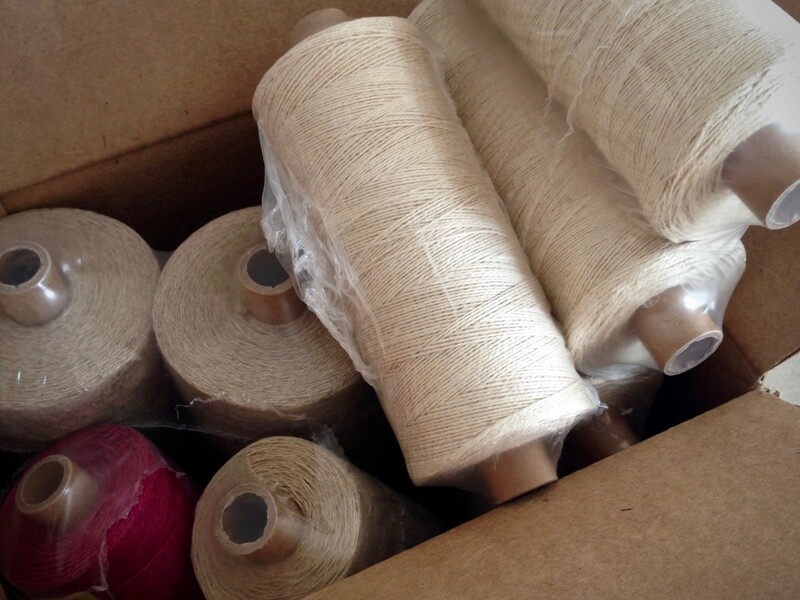 Bleached 22/2 cottolin is used for the warp and for the tabby weft. 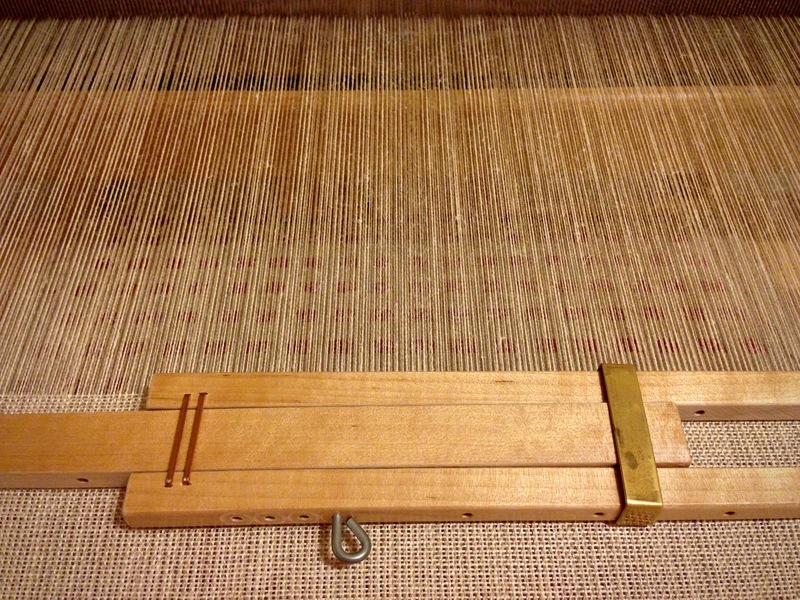 View of the back of the halvdräll cloth under the advancing warp. God has a life plan for us that reveals His glory. His instruction gives me wisdom, insight, and understanding for life. It is much like following a halvdräll weaving draft to produce halvdräll fabric, and witnessing the fabric at its best as it glistens in the afternoon sunshine. May you enjoy the wonder of Christmas. 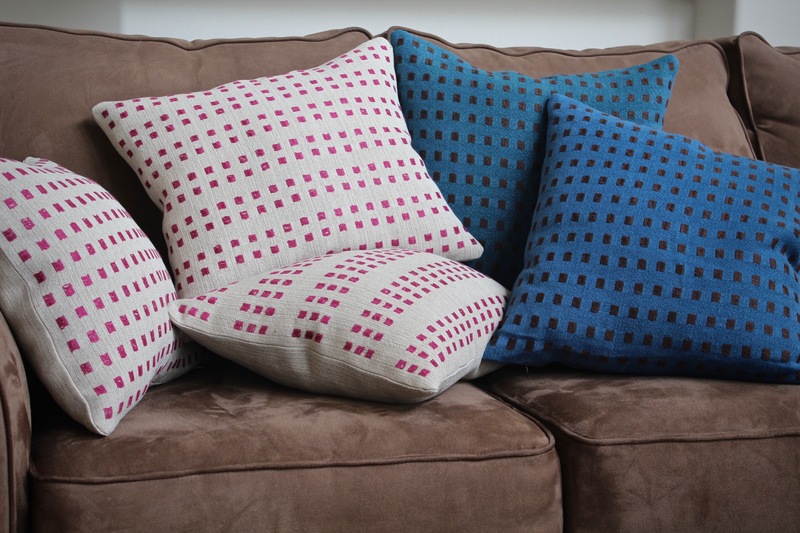 I forgot to tell you how excited I was to see your article in Handwoven, as I read my magazine that night I came across your article and I was so happy for you, what a good job and beautiful pillows. Another technique to add to my list of things to learn! Thank you so much, Liberty! Your encouragement means a lot. Barbara, same to you! May your family enjoy a very blessed Christmas! Finished linen dice weave pillows are shipped off to Fort Collins, Colorado to meet the Handwoven editorial team. 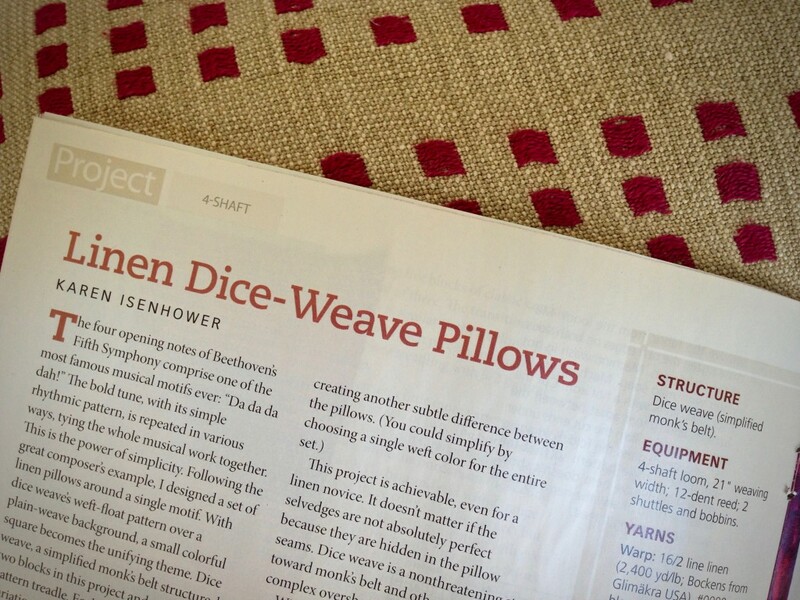 Linen issue of Handwoven has good information and interesting projects, including instructions for linen dice weave pillows. We think everything is going according to our plans, and then we run into surprises. Even a good surprise involves challenges, stretching us out of our comfort zones. God is completely faithful. He has certainly been faithful to me. I find relief in knowing the Grand Weaver is overseeing the fabric of my life. What seems like a surprise to me is actually part of his carefully designed plan. May you be caught in the act of making something good. Yeaa, yes I saw that and said hmmm, I know that name…congratulations and yes what a wonderful surprise that must be. You inspire me, thanks. Congratulations! 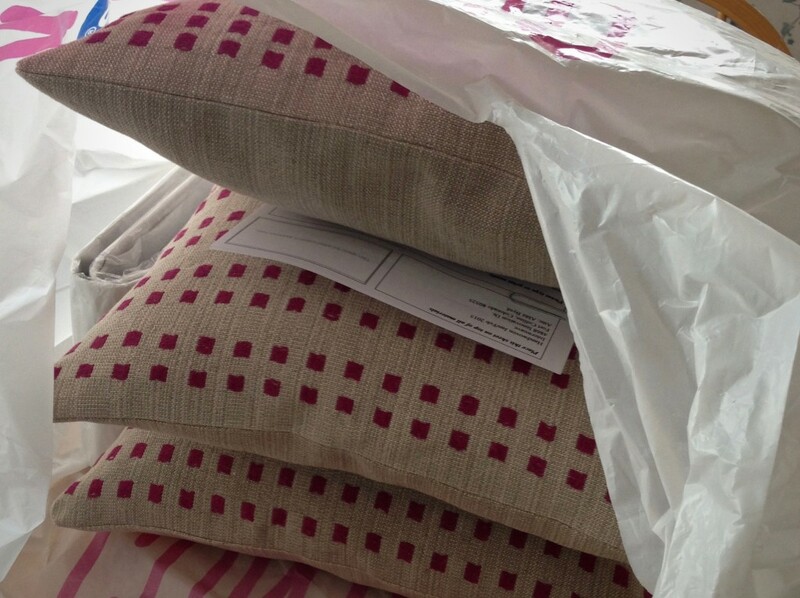 I got my issue yesterday but only had time to skim…and completely missed that those pillows were yours! Will go look more closely as soon as I finish that last Monk’s Belt Christmas gift runner…. How exciting!! What a blessing for you and for all is us!! Congratulations to you for being published. Quite an honor. I have actually had information in 2 articles oh over 8 years ago. Still feels good. I enjoy your blog. Thanks, Merry Christmas, Helen Hart in snowy Cheyenne, WY. Brrrr! Congrats – I haven’t gotten my issue yet, hopefully it will arrive soon. I am so happy for you. 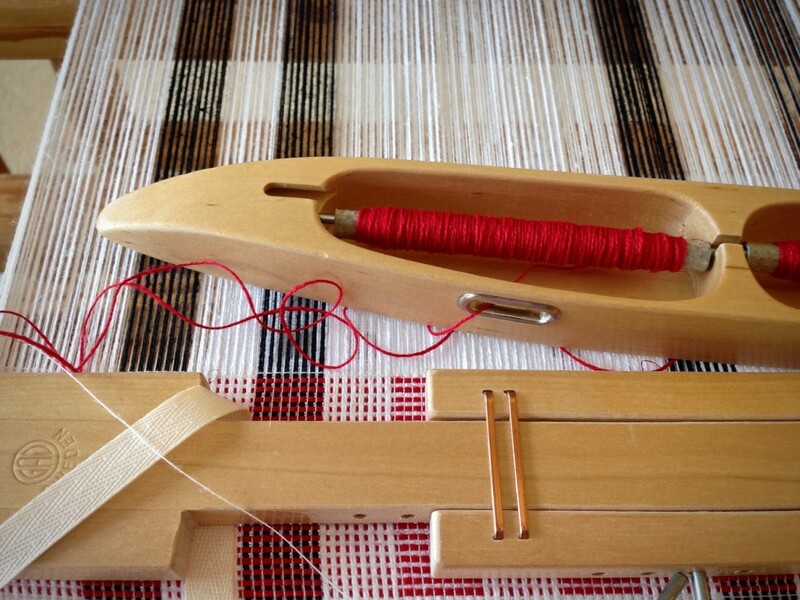 I love your inspirational messages as well as your weaving wisdom. Hope to see more of your work in Handwoven! Congratulations! The pillows are lovely. Congratulations Karen, quite a well deserved honor. I too had a project featured in the Sept/Oct issue. 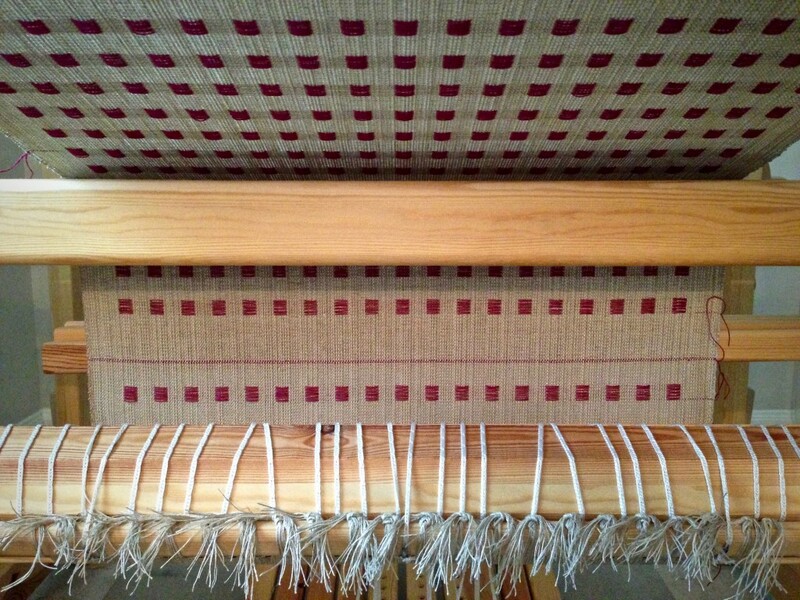 Quite humbling for me, being a new weaver, amazing what God does in our lives!! Congratulations Karen. 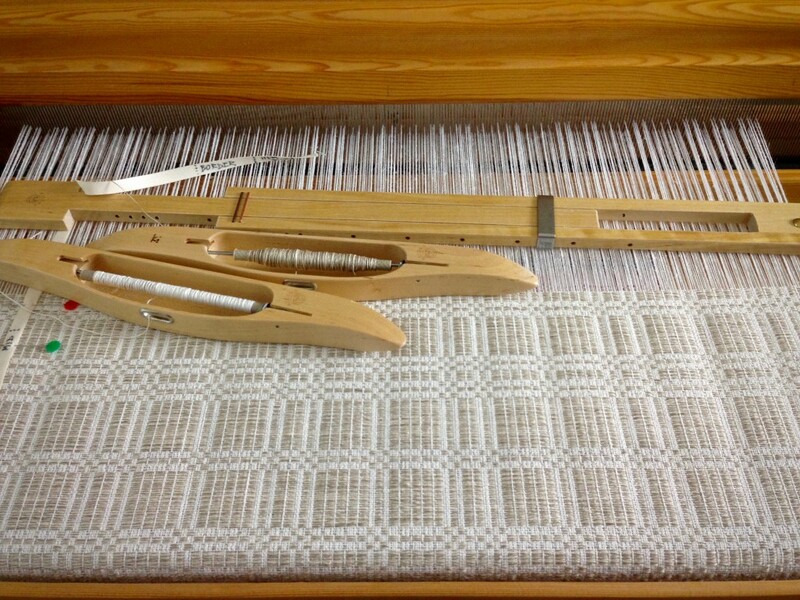 Your weaving is wonderful! 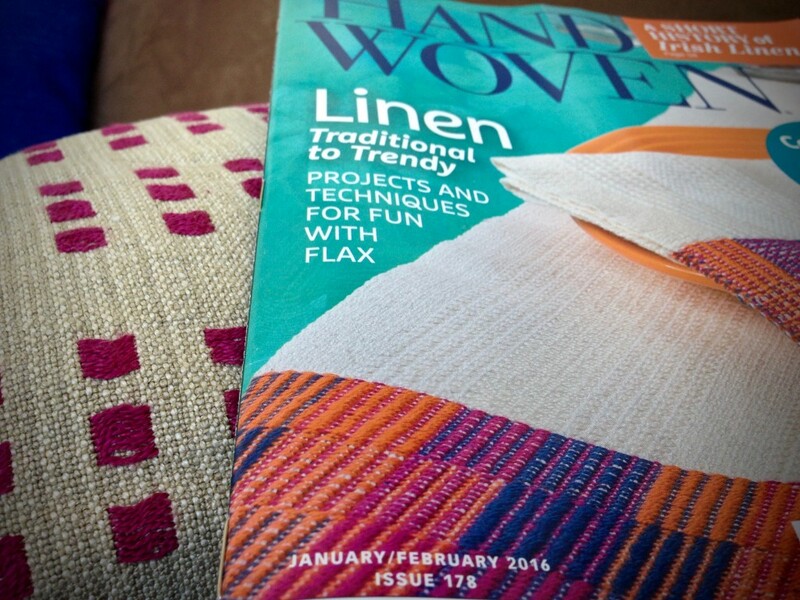 I was so thrilled when I saw your article in my new Handwoven. Congratulations, Karen! I have the most wonderful blog friends! Thank you all for the incredibly kind and sweet comments. I treasure each one, and I treasure each one of you! I’m so thankful that we are in this together. Great! Looking forward to reading the article! Hi Janie, Thanks so much!